← NABLOPOMO – Yikes! The Season is Full Upon Us!! …our lives as humans are enriched by getting to know the creatures in our care as the quirky, unique creatures they are. What a long day yesterday turned out to be! The morning started terribly sadly when I was down at the turkey field and looked over to see the vet standing over the fallen body of Star, a lovely old horse who has been old for as long as we’ve lived in the neighbourhood (since 1996). Star was a bit of an institution around these parts – owned by the delightful T. S., who has been an honorary guardian of Elk Lake Park for many, many years. Riding his other horse, Marhsall, often T. S. could be seen leading old Star as the three of them set off for long rides through the maze of trails in the park. Star, at the grand old age of 38 had been part of T. S’s life since he was a three year-old just learning the riding ropes. It seemed like Star would just keep on trucking… forever – and, indeed, he remained quite healthy and spritely right up until the end when, at last, his heart just gave out. And yet, it happens – they worm their way into our hearts and even if we know one is ailing or ancient or beyond treatment and that the kindest thing to do is relieve their suffering, it can be devastating when a beloved pet dies. This conversation then moved on to talking about the farm animals and how hard it is when you raise animals for meat to bond with them, name them, learn all their quirks and preferences only to have to plan their final one-way trip off the farm. 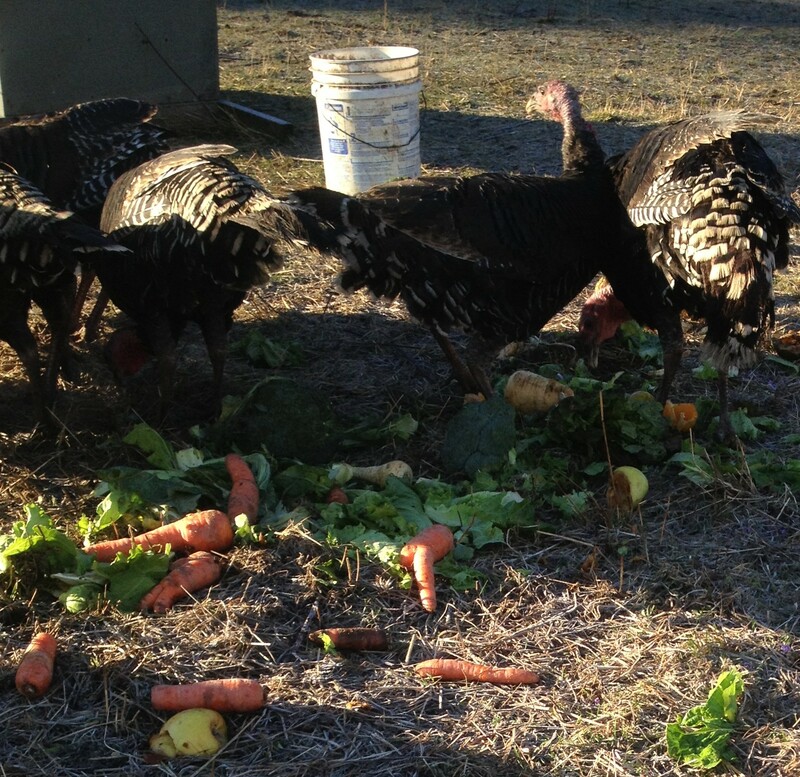 Before I started raising turkeys, you would never have convinced me that turkey departure day would be a tough day, but it is. I totally understand now how some people have a special turkey or two around with pet status. They are funny, mischievous, intelligent birds in their way, and I thoroughly enjoy their interactions with each other, with me, with the other animals, and with visitors to the farm. Later in the evening at Spyder Ranch the conversation once again turned to critters, this time to a couple of hens. One might think that one chicken is pretty much the same as any other chicken, but that would only be if you haven’t had the pleasure of spending time with hens and getting to know just how unique each personality is. C: Did you know one of your hens comes over here every day to visit? I immediately thought it must be Lucy, the melodramatic red-head who conned me into pulling her out of the specialty laying flock and giving her private accommodations in the hay shelter. A number of weeks ago, Lucy (a fluffy orange buff orpington) refused to come out of the henhouse in the morning. She clung grimly to the perch, wheezing and hacking. She sounded like she was on death’s door, so I picked her up, tucked her under my arm, and took her from the hen pen to a dog kennel in the hay shelter where I could isolate her from the other birds, keep a close eye on her, and pamper her a bit. For as long as I was carrying her she coughed and gagged and wheezed and, to be honest, I didn’t think was likely to make it beyond the end of my morning rounds. I prepared her some breakfast, gave her a dish of water, and left her alone while I continued with the chores. She got very quiet, hunkered down, and had a nap. That was the last time she ever coughed or wheezed – not because she had crossed the rainbow bridge but because she must have just had something stuck in her craw and that something got unstuck… Either that, or she had figured life might be more interesting if she wasn’t with her same-old, same-old roomies. I monitored her for a week, just in case there was some sort of respiratory infection going on and then, on the morning when I reached inside the dog kennel to return her to her flock mates she flew the coop. It was like she had planned the whole thing – she burst out of that kennel like she’d been shot out of a cannon. She sprinted for the hog pen and happily chowed down on their breakfast. 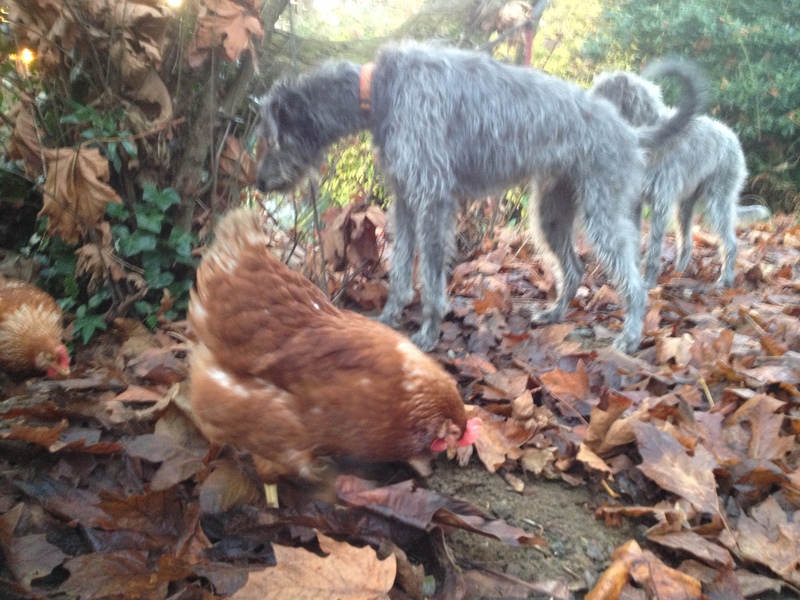 She has been free ranging ever since, partnering up with Fritz, the frizzle bantam (a story for another day) and, each evening, putting herself to bed in the dog kennel. 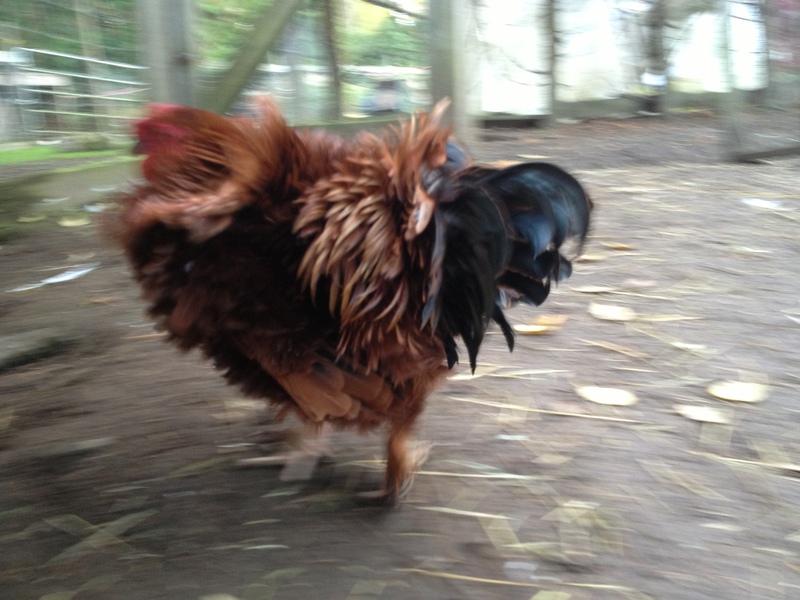 Obviously, when C. mentioned that one of my hens was roaming, I assumed it was Lucy. But no, turns out it is one of my new layers who are still living up near the house. Apparently, each morning she hops the fence that runs along the cedar hedge and saunters over to the Spyder Ranch chicken pen… She snacks all along the way and then pulls faces at C’s hens knowing, I suppose, that they are not currently ranging around and, therefore, can’t catch her. Then, she meanders back to our place and melts back into the crowd. I had no idea she was missing as each morning the correct number of birds march down the ramp of the chicken coop. Me: Did you know one of your hens comes over to my place every morning? 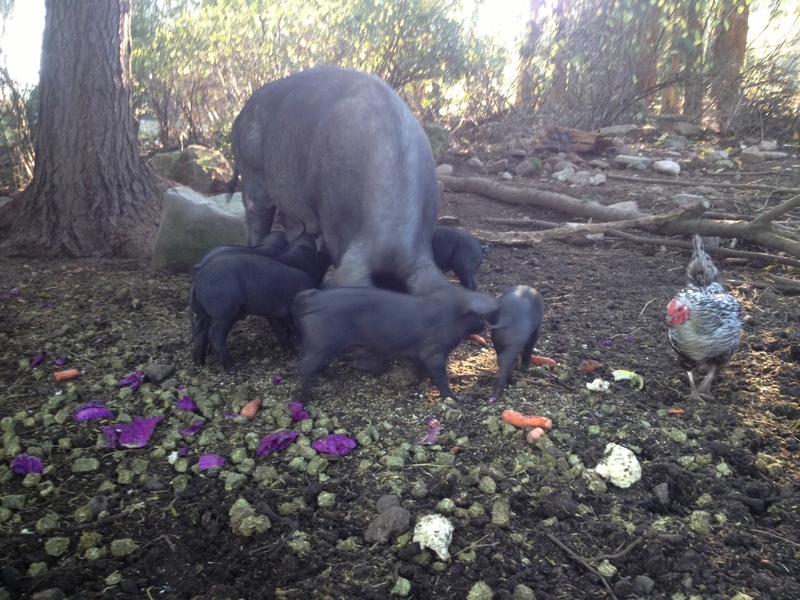 Rebel, sharing breakfast with Cora and her piglets. Rebel, it turns out, is well named. She refuses to lay her egg in the henhouse (she prefers the container of oyster shell) and refuses to stay anywhere near C’s hen pen during the day. Instead, she marches over to my place each morning and straight into the hog pen for breakfast. She and Lucy politely ignore each other and gobble up whatever they can before the hogs chase them away. At dusk last week, Rebel strode off across the horse paddock heading for home but somehow thought she wasn’t going to get back into the coop at C’s on time because she turned around, jumped up on top of my truck and started grumbling and complaining. Then she started shouting at me, the noise a hen might make if she were able to crow. Thinking she might have been locked out (she had been a bit late heading for home) I popped her into another dog crate beside Lucy and there she stayed until morning. “The other girls were calling for her like they knew she was missing,” C. said. Rebel has since moved her departure time up a little to give herself a bit of extra leeway for the commute and has not missed an evening lock-up since. It’s not like I think of the animals as humans in hog suits or chicken costumes, but you really don’t have to spend a whole lot of time with them to discover just how unique each individual is. With a relatively small farm it’s possible to respond to those idiosyncrasies and accommodate odd birds like Rebel and Lucy. No matter how much one might like animals, I just can’t see how that could be possible in a large operation with thousands of birds or hogs or whatever housed together. Which is too bad because I don’t think it’s only the animals that miss out: our lives as humans are enriched by getting to know the creatures in our care as the quirky, unique creatures they are. You’re right that our lives are enriched by getting to know the creatures in our care. The hardest job I ever did was working as a veterinary nurse and seeing pets being put to sleep, and even though the animal wasn’t mine I would cry for the loss anyway because ultimately the owners were losing a member of their family. Loved the stories of the chickens. I have the Three Musketeers right now, roaming free, giving free range a really wide definition (all the way to my neighbour’s garden). 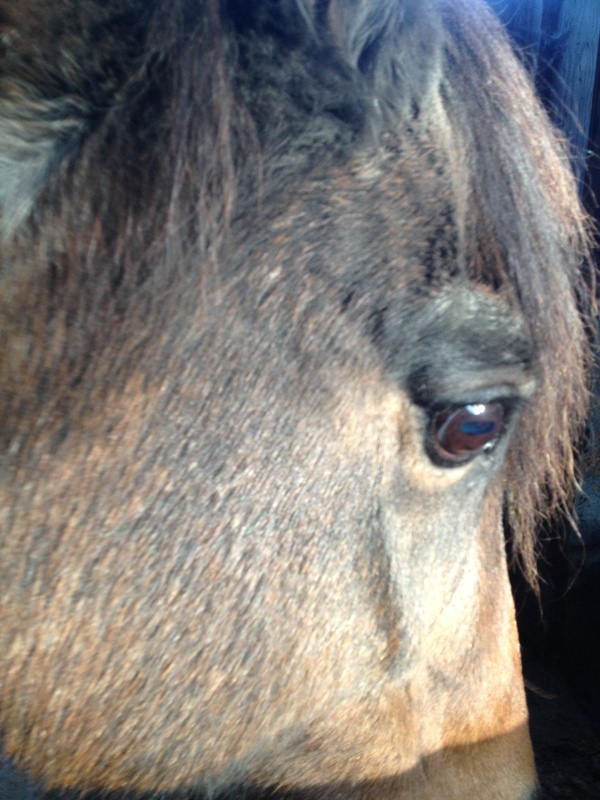 Sad day with the demise of Star, but what a great age he reached. And I totally agree that our lives are enriched by the animals in our care. Have the Three Musketeers been making trouble in your neighbour’s garden? 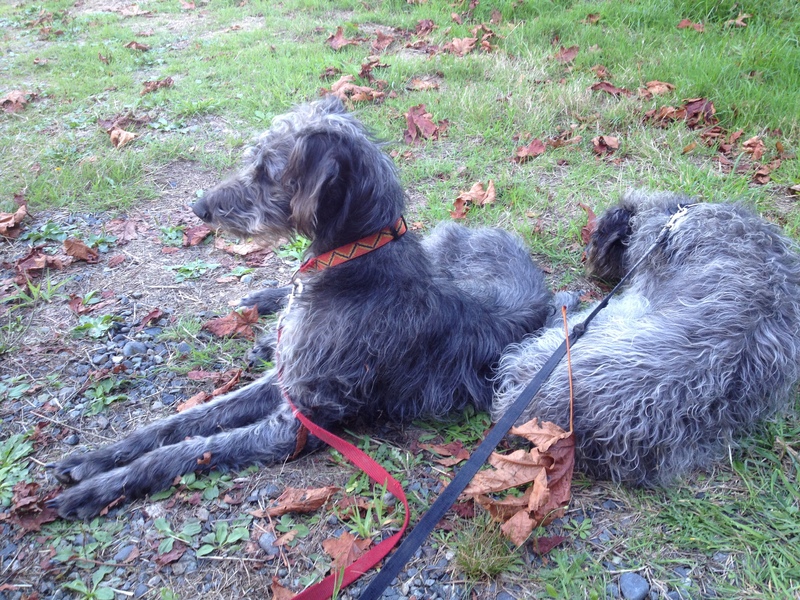 Or are they reasonably well behaved when they go visiting? They actually got redubbed the Marauders recently, which should tell you how circumspect they are on the neighbour’s side of the fence.